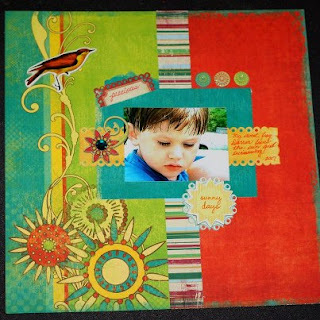 This is the layout I am using for the "Brights" Challenge for Cards Galore! I hope everyone likes it....this is a photo of my little boy...hes soooooooo handsome...lol..Thanks for viewing!! I love it Kim, and think its perfect for the challenge at Cards Galore. Good luck girlfriend. This layout is FAB! Fantastic use of bright colours and the LO frames the photo perfectly. Thanks for sharing with us at the CG SCrapbook Challange.